Two weeks ago, while walking around Hillcrest, my wife and I briefly stopped by the local, massive, used bookstore. To my surprise, the place was three-quarters emptied and going out of business. Yikes! I hadn’t shopped there for nearly a year, when purchasing a paperback for myself later given to my father-in-law. 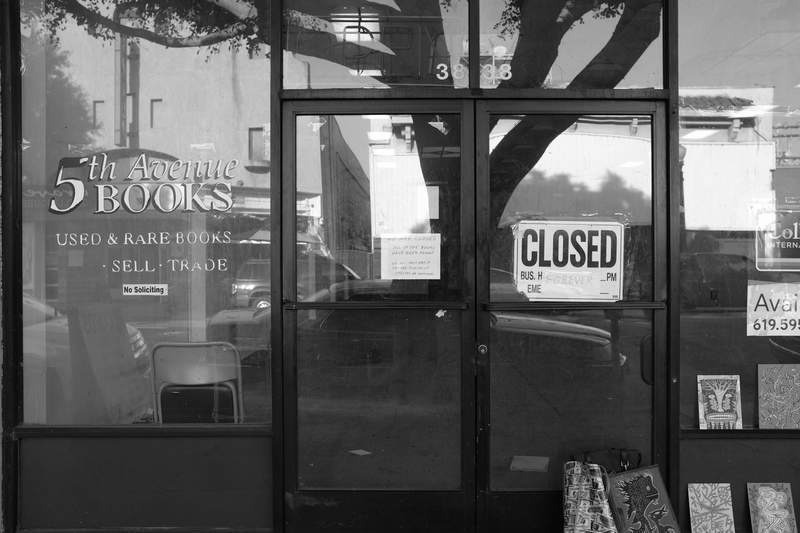 While 5th Avenue Books is gone, online counterpart Schrader’s Books will continue selling used titles through Amazon. As someone who almost exclusively reads ebooks, I occasionally—but, honestly, rarely—shopped out-of-prints not available in digital format, almost always finding the sought-after read. That last purchase: The Past Through Tomorrow by Robert A. Heinlein, an old-time favorite selling for three bucks. When I first bought the anthology in high school, it came as a set with two other titles: Stranger in a Strange Land and Time Enough for Love. During the last year of my father-in-law’s life, reading became his main recreation. I donated the Heinlein title to that cause. Following the 95 year-old’s death nine weeks ago, I reclaimed the book to read and as remembrance. I used the Fujifilm X100F with Acros film simulation applied to shoot the closed bookshop, yesterday afternoon. Vitals: f/4, ISO 200, 1/125 sec, 23mm; 5:17 p.m. PDT. The from-camera, unprocessed JPEG is huge, 11MB. You can better see the captured detail by clicking here. 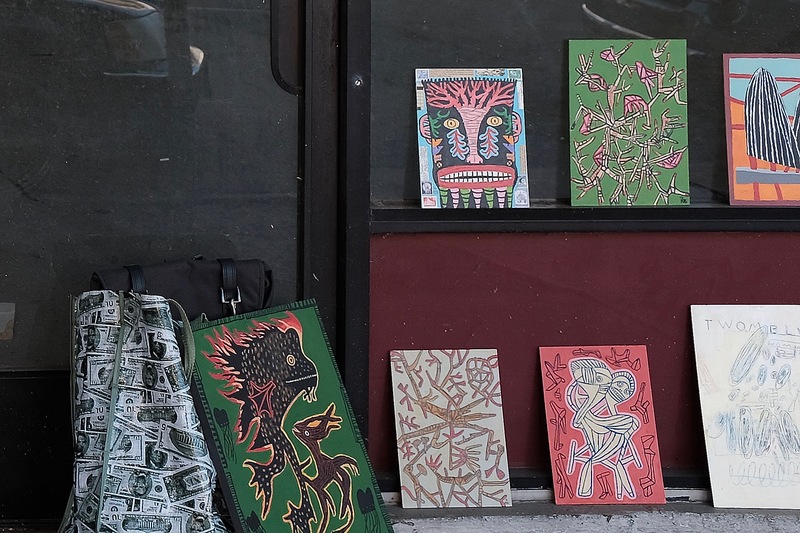 The color rendition is cropped about 140 percent to focus on art a street seller displayed outside the abandoned store. I enhanced the JPEG, shot with Velvia film simulation, using Sharpener Pro 3 from the Google Nik Collection. Vitals are same as the black and white, one minute earlier.